Thousands of marketers use Google Analytics as an overview of website performance. However many may not use custom segmentation, which is a great way of diving deep into your data. It can give you a much greater understanding of how visitors are using your website and provides a much more accurate way of tracking how effective your digital marketing efforts really are. 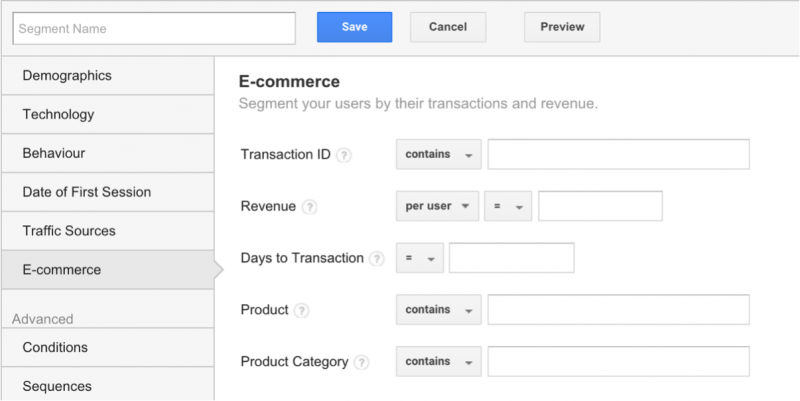 However, Google Analytics offers the functionality to create your own segments. Creating your own segments gives you the opportunity to look at specific traffic that may be much more relevant to your website and marketing activity. Demographics – Allows you to segment users by demographic information such as Age, Gender and Language. Behaviour – Segmentation based on user behaviour such as transactions, session duration and sessions. Date of First Session – Allows to segment users based on when they first visited the site between certain dates. Traffic Sources – Segmentation based on users/sessions by how they found you. E-Commerce – If you have e-commerce tracking set up then this allows for e-commerce segmentation. Segmenting can be based on a number of options including product, category and revenue. Conditions – This advanced segment allows you to look at traffic based on specific conditions such as acquisition type, behaviour and devices. It also allows you to add other conditions. e.g. – Organic traffic that has converted. Sequences – Segments based on sequences filter traffic that follow a specific path that you can set. Here are some simple segments that you can make to transform your reporting and analysis. Google has recently announced they are going to start automatically filtering out spam traffic from reports (YAY!). However it will still appear in your historical data and can make a real impact on your behaviour metrics. This segment will give you the ability to look at your referral traffic without that nuisance spam showing up. Here is one that I’ve made just for you! If you’d like to create your own segment or know how to edit my one, here’s how I did it. First of all change the Filter to ‘Exclude’. Then change ‘Ad Content’ to ‘Source’ and and ‘Contains to ‘Matches Regex’. You can then add any spammy websites that appear in your analytics. Add a ‘|’ (vertical bar) in-between sites and words. Notice that I’ve just included ‘xyz’ to eliminate the large amount of spam websites that end with ‘.xyz’. To quickly find spammy websites, order your referral traffic by time on site or bounce rate and look for 100% bounce rates and 0:00 time on site. However as Crawler Spam does leave some behaviour metrics, make sure you do go through with a fine comb. Make sure to not end with a vertical bar (|) as it cause the segment to not work (many thanks to my colleague Sam who pointed this out to me while I sat at my desk for 5 minutes shouting “WHY AREN’T YOU WORKING” at my computer screen). If you spend time and money on social ads then this conditions segment can show you how that paid traffic performs. You can input the source name to whatever social network you want to analyse. If you are advertising the same product/page across multiple social networks, then having different segments is a great way to look at what social network is most effective for your goal. Is there one social network performing better than others? Should you spend more money on that channel instead? If you want to only look at non paid social traffic then you can create a custom segment that looks the same as above, but change the additional ‘AND’ parameter values from ‘contains’ to ‘does not contain’. If blogging is a part of your digital marketing strategy then this is a great way to see if your blogs are attracting traffic. This segment only shows you data from visits that started from landing on a blog post. From here you can assess if acquiring traffic through your blog is effective (conversions, bounce rate etc.). This can help you measure and shape your content strategy. Please note that you will have to change /blog/ to whatever you call your blogging page (e.g. news, latest etc.). To take this segment one step further you can add a condition to the sequence. A useful condition to add is acquisition source. This is helpful to see how the user landed on the blog (e.g. Social, Organic, Referral etc.) and assess how that effects behaviour. This segment can help you understand why traffic from certain sources may be converting better than others, or why certain sources aren’t converting. In order for this segment to work you must have goals set up. The first parameter defines the source of traffic. The ‘AND’ parameter determines whether you want to include or exclude goals. To assess converted traffic choose the greater than symbol (>). To look at non converters, choose the = symbol. Keep the numerical value as 0. Goal completions can also be changed to specific goals, if you want to measure those individual goals rather than all goals together. Even though converters and non converters are already available as a pre-designed segment, adding in the source allows for an easy comparison to asses how the source of the traffic has an effect on conversion. What source converts best? Are converters and non converters from the same source landing on different pages? Assessing this data can help you understand why certain traffic may not be converting, and allow you to make the steps to change that. If you have an e-commerce site then the standard E-commerce segment has a number of options which you can use to understand purchasing behaviour. One of my favourite elements of this is the Revenue option. This allows you to easily segment between different value levels of customers and look for trends. Do high value customers visit through a certain source, land on a certain page or visit through a certain campaign? This again allows you to assess your marketing efforts and content, and make adjustments to encourage more high value conversions. As digital marketers we rely on data to make smart business and marketing decisions. Custom segments are a great way to analyse specifics about your audience, website and marketing activities. The above examples are simple to create, and only scratch the surface of what is possible with custom segments.